A dungeon is a subterranean jail cell, and is sometimes referred to as a keep or stronghold. 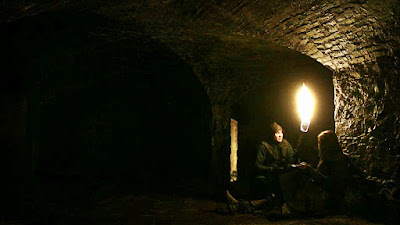 Often times, one will find this underground prison in a medieval castle. In science fiction or cult-TV history, however, dungeons might be found all over the universe, and across all different time periods as well. 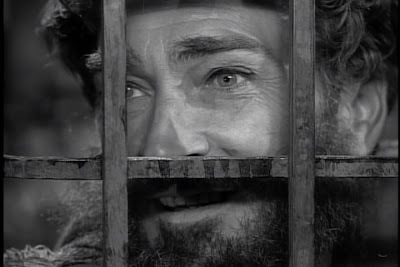 One of the most unforgettable TV dungeons appears in a Twilight Zone (1959-1964) episode titled "The Howling Man." 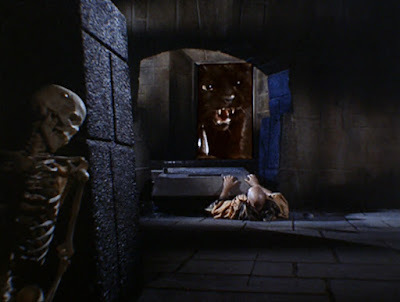 In this haunting tale, a traveler in Europe happens upon an old monastery, and stays the night there when he falls ill. During the dark, lonely hours of night, the visitor hears a strange howling emanating from the dungeon. There, a stranger is locked up...begging to be released. The stranger, however, is a sinister sort, and his continued presence in this dungeon is a necessity if the human race is to prosper and know peace. 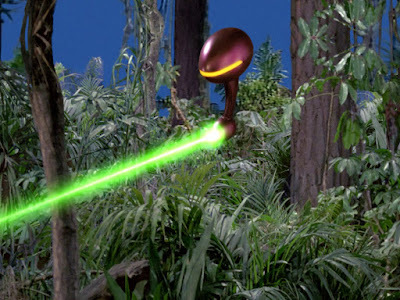 Although set in the 23rd century, Star Trek (1966-1969) features many dungeons out there, on the final frontier. In the first season story, "The Return of the Archons," for instance, hooded Lawgivers (the servants of a "God" known as Landru) throw Kirk's landing party in a dungeon to wait until they become assimilated into "The Body." 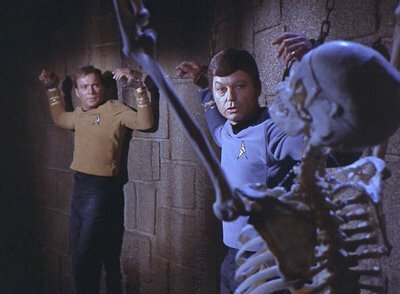 In a second season story, "Catspaw," Kirk, Spock and McCoy end up chained in a dungeon, in a witch's castle, on a distant world. It is guarded, of course, by a giant black cat (in keeping with the Halloween-styled imagery). The Space:1999 (1975-1977) story "Journey to Where" ends in a dungeon. A time travel mistake sends Commander Koenig, Dr. Russell and Captain Alan Carter back to Earth, but during the battle of Bannockburn in the 1310's. The Alphans are captured, held in a dungeon, and nearly burned alive before Maya discerns a method of returning them to the errant moon. A dungeon of sorts is featured in The X-Files (1993-2002) episode "Alone," which sees Doggett (Robert Patrick) in pursuit of a murderous lizard-man. He discovers that the lizard man's victims end up in a subterranean tunnel -- or dungeon -- to be eaten alive. Of course, Game of Thrones (2011 - ) features dungeons on a semi-regular basis, whether to house dragons, or the bones of Stark kin, and ancestors.